Firm of monumental sculptors established in 1881, by George Scott (1845-1903) and Robert Rae (1845-1910), after acquiring the building firm of Robert Cruickshank & Son, whose year of founding, 1838, was eventually quoted in Scott & Rae's advertising as the year of their own founding. 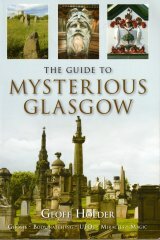 They operated from a yard at 390 Eglinton Street and a showroom at 67 Bothwell Street, producing a huge number of monuments for the Necropolis and cemeteries throughout Scotland and the US, all carved in grey granite from their Killemabreck quarries and pink granite from Aberdeenshire. Designed predominently in the Classical styles of Greece, Rome and Egypt, with obelisks a popular product, these often incorporated marble or bronze portrait medallions (probably by independent sculptors) although most of these have since been removed. Local examples with portrait panels intact are the monuments to Franc Gibb Dougal, Riddrie Park Cemetery (1906); Robert Ford, Sandymount Cemetery (1907), and Rev. Donald McCorquodale, Cathcart Cemetery (1908). Their Necropolis work includes the monument to Rev James Morrison, the founder of the Evangelical Union (1895), whilst for Eastwood New Cemetery they produced the monument to Richard Waldon, the proprietor and manager of the Princess' Theatre, which is carved with a relief of the theatre's cast iron entrance canopy (1923). They also produced the monument to Rev William McArra Halley, the minister of the town's High St. UP Church, for Dumbarton Cemetery (1893). One of their commemorative commissions involving a 'named' sculptor was the Rev James Bonnar Memorial Plaque, East Kilbride UF Church, which features a bronze portrait by Alexander Petrie (1901). In 1903, the firm was commissioned to produce the Battle of Bothwell Bridge Memorial near Bothwell in Lanarkshire, a colossal obelisk commemorating the Battle of Bothwell Bidge, of 1679. An illustration of the memorial was used in the firm's advertisements for many years afterwards. Scott & Rae also executed several public drinking fountains in Glasgow including, the Cowlairs Co-Op Fountain, Springburn (1902), the James Pollock McPhun Fountain, Glasgow Green (1906) and the two William Annan Fountains in Townhead (1908) and Cowcaddens (1915). After World War I, the firm supplied the grey Killemabreck granite for Glasgow's World War I Cenotaph in George Square (1921-4), and executed a number of other war memorials throughout Scotland, e.g., Girvan (1919); Thornliebank (c.1920); Gatehouse of Fleet (1921) and Renfrew, which features reliefs carved in sandstone by James Young (c. 1922). See list of war memorials, below. As pavement, cement and granite merchants they provided materials for major building works in Glasgow, such as Kirklee Bridge (1900); Queen Margaret Bridge (1926-9); the Union Bank, 110-20 St Vincent Street (1924-7), as well as supplying the granite sets and kerbstones for the city's streets (many of which are inscribed with their masons' initials or symbols). The firm became Scott Rae Stevenson Ltd, in 1971, and in 1979, the name Scott & Rae was purchased by Matthew Bruce, a former mason with the firm, who continues to trade under its name. A particularly detailed account of the firm and their Cowlairs fountain is Dr Gilbert T Bell's Of Fountains and Letterheads (1998, Springburn Museum Trust Information Sheet, 2), which includes archive photographs of the fountain and a contemporary advert for the firm, together with engravings of some of their standard gravestones (a drawing of the Cowlairs fountain was also used as the museum's letterhead). All memorials in Scotland, unless otherwise stated.